The recent surge of refugees into Europe has featured prominently in the anti-immigrant rhetoric of right-wing parties across the Continent and in the heated debate over the UK’s decision to exit the European Union. At the same time, attacks in Paris and Brussels have fueled public fears about terrorism. As a new Pew Research Center survey illustrates, the refugee crisis and the threat of terrorism are very much related to one another in the minds of many Europeans. In eight of the 10 European nations surveyed, half or more believe incoming refugees increase the likelihood of terrorism in their country. But terrorism is not the only concern people have about refugees. Many are also worried that they will be an economic burden. Half or more in five nations say refugees will take away jobs and social benefits. Hungarians, Poles, Greeks, Italians and French identify this as their greatest concern. Sweden and Germany are the only countries where at least half say refugees make their nation stronger because of their work and talents. Fears linking refugees and crime are much less pervasive, although nearly half in Italy and Sweden say refugees are more to blame for crime than other groups. Most of the recent refugees to Europe are arriving from majority-Muslim nations, such as Syria and Iraq. Among Europeans, perceptions of refugees are influenced in part by negative attitudes toward Muslims already living in Europe. In Hungary, Italy, Poland and Greece, more than six-in-ten say they have an unfavorable opinion of the Muslims in their country – an opinion shared by at least one-in-four in each nation polled. While most Europeans think the recent surge of refugees could lead to more terrorism, there is less alarm that Muslims already living on the Continent might sympathize with extremists. The percentage of the public saying that most or many Muslims in their country support groups like ISIS is less than half in every nation polled. Still, 46% of Italians, 37% of Hungarians, 35% of Poles and 30% of Greeks think Muslims in their countries are favorably inclined toward such extremist groups. On these and other questions included on the poll, Greece, Hungary, Italy and Poland often stand out for expressing greater concern and more negative views about refugees and minority groups. Across the EU nations surveyed, the refugee crisis has brought into sharp relief deep ideological divides over views of minorities and diversity. On nearly all of the questions analyzed in this report, people on the ideological right express more concerns about refugees, more negative attitudes toward minorities and less enthusiasm for a diverse society. For example, negative opinions about Muslims are much more common among respondents who place themselves on the right of the ideological spectrum. In Greece, 81% of those on the right express an unfavorable view of Muslims, compared with 50% of those on the left. Significant right-left gaps in attitudes toward Muslims are also found in Germany, Italy, the Netherlands, Sweden, Spain, France and the United Kingdom. Similarly, supporters of far-right political parties hold much more negative attitudes toward refugees and Muslims and are much more skeptical about the benefits of a diverse society. For instance, fears that the surge of refugees will lead to more terrorism and harm the economy are considerably more widespread among supporters of the UK Independence Party (UKIP) in the UK and the National Front in France. 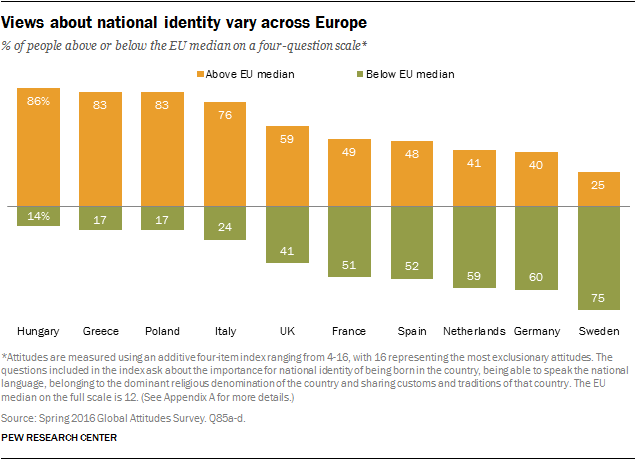 Ideology is not the only dividing line in European attitudes, however. On many questions, education and age also matter, with older people and less-educated individuals expressing more negative opinions about refugees and minorities. These are among the key findings from a new survey by Pew Research Center, conducted in 10 European Union nations and the United States among 11,494 respondents from April 4 to May 12, 2016, before the Brexit referendum in the UK and terrorist attacks at the Istanbul Atatürk Airport, both of which took place in late June. The survey includes countries that account for 80% of the EU-28 population and 82% of the EU’s gross domestic product. Along with worries about refugees and minorities, the survey finds mixed views regarding the overall value of cultural diversity. When asked whether having an increasing number of people of many different races, ethnic groups and nationalities in their country makes their society a better place to live, a worse place or does not make much difference either way, over half of Greeks and Italians and about four-in-ten Hungarians and Poles say growing diversity makes things worse. Muslims are not the only minority group viewed unfavorably by substantial percentages of Europeans. 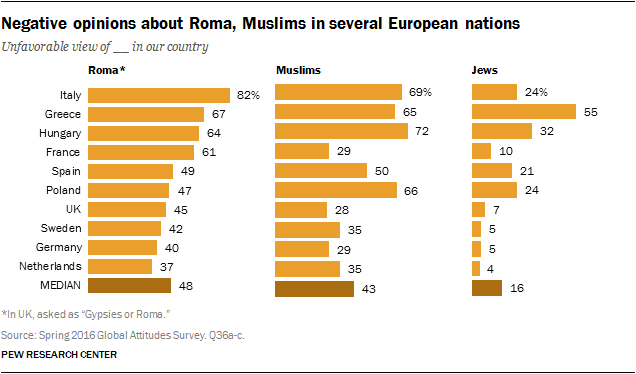 In fact, overall, attitudes toward Roma are more negative than attitudes toward Muslims. Across the 10 nations polled, a median of 48% express an unfavorable opinion of Roma in their country. Fully 82% hold this view in Italy, while six-in-ten or more say the same in Greece, Hungary and France. Negative views of Roma have gone up since 2015 in Spain (+14 percentage points), the UK (+8) and Germany (+6). Greeks have also become increasingly unfavorable (+14 points) since 2014, the last time Greece was included in the survey. Negative attitudes toward Jews are much less common. A median of only 16% have an unfavorable opinion of Jews in their country. Still, a majority of Greeks give Jews in their country a negative rating, and one-in-five or more express this view in Hungary, Poland, Italy and Spain. Unfavorable attitudes toward Jews have been relatively stable since 2015. Opinions vary about the key components of national identity, but European publics clearly agree that language is fundamental. Across the 10 EU countries surveyed, a median of 97% think that being able to speak the national language is important for truly being able to identify with their nationality. A median of 77% say this is very important. Majorities believe it is very important in every nation polled. There is also a strong cultural component to national identity. A median of 86% believe sharing national customs and traditions is important, with 48% saying this is very important. Fully 68% in Hungary say sharing national customs and traditions is very important for being truly Hungarian, and 66% express similar sentiments in Greece. In contrast, fewer than four-in-ten consider sharing these traditions and customs very important in the Netherlands (37%), Germany (29%) and Sweden (26%). There is less agreement about the need to be born in a given country. Still, a median of 58% say it is important for someone to be born in a country to be truly considered a national of that country; a third think this is very important. Religion is generally seen as less central to national identity. However, it is an essential factor to many in Greece, where 54% say it is very important to be Christian to be truly Greek. To further explore this topic, we constructed an index based on the four questions we asked regarding national identity (importance of speaking the national language, sharing customs, being native born and being Christian). The results highlight the extent to which exclusionary views vary across the EU. By far, restrictive views are most common in Hungary, Greece, Poland and Italy; they are least common in Sweden, Germany and the Netherlands.